Serious pedal infections, in people with diabetes, can easily lead to amputation. Tissue concentration of antibiotic is dependent upon the ability to get high enough blood levels to achieve tissue concentration greater than MIC for extended time frame. Review of the literature shows that type I bovine collagen allows for a sustained linear zero order kinetic release of drugs. Clinical evidence is used to illustrate how three commonly utilized antibiotics can be impregnated into collagen in order to assist with achieving resolution of infection in deep soft tissue or osteomyelitis infections of the feet. Today's health care practitioner has the burden of providing cost effective care. Infections are no exception. Today we all try to manage our patients with a minimal number of hospital stays. This case report shows a possible new method of drug delivery of antibiotics in serious, significant infections including deep space soft tissue or osteomyelitis infections of the feet that may lead to minimizing need for inpatient care. As clinicians treat infections there exist certain basic concerns on all patients. These include such problems as general health status (e.g. diabetes, peripheral vascular disease, collagen vascular disorders). In arterial ischemic diseases, the lack of blood flow to tissue results in compromise of delivery of macrophages and nutrients to allow cells to fight infections. Similarly antibiotic delivery in the bloodstream and thus to the tissues is compromised. The protocols listed in this article are designed for clinicians to test these results on their own patients to see if in fact this new drug delivery system can assist in resolving the enigma of amputation and perhaps shorter length of stay in these cases. Virtually all human organs and tissues contain connective tissue. Connective tissue macro molecules are composed of at least 19 known forms of collagen. This article will focus on Type I collagen as a drug delivery vehicle. Type I collagen, the most abundant form of collagen in humans is found in all connective tissues except hyaline cartilage and basement membranes. The collagen molecule is composed of two alpha and one alpha2 chains wrapped in a triple helix with three left handed helical alpha chains twisted into a right handed super helix structure. [3,4] The alpha chains are similar in structure and contain approximately 1000 amino acid residues where commonly every third molecule is glycine. The other amino acids are either leucine and proline, or hydroxyleucine and hydroxyproline. To maintain this structure, hydrogen bonds and disulfide bonds must remain intact or it results in a non-functional protein. This triple helix arranged collagen is known as fibrillar collagen. Collagen has been reported as a well tolerated and completely biodegradable material. In addition, collagen has been utilized as a carrier system for occular application, involving pilocarpine and macrolide antibiotics. [6,7,8] Collagen has been shown to be a drug carrier vehicle for lipophillic drugs including tretinoin and lidocaine. Collagen, when combined with chitosan has acted as a transdermal delivery system for delivering calcium channel blocker, and beta blocker drugs. The releasing system of collagen has been shown to be sustained over time (approximately 2.5 days) in a linear fashion. Collagen sheets with impregnated gentamycin have been used to treat chronic osteomyelitis. During the course this study, the systemic absorption of gentamycin after the collagen sponge was implanted into patients, was found to be minimal (if present at all). The mechanism elucidated for this process shows that the collagen triple helix contains about 17% charged amino acid residues which are uniformly distributed over its entire length. Under physiological conditions, the overall net charge is neutral. With specific chemical reactions, the collagen molecule can be modified to yield a net negative, or a net positive charge. This results in an enhanced retention of the oppositely charged drugs by binding interactions. The literature suggests that type I collagen, in a triple helix arrangement, may give a steady sustained release of antimicrobial agents in infectious disease. This report will review the clinical application of this in 12 patients with active, clinically significant infections involving deep soft tissues or bone. A total of 12 patients were evaluated by the same physician. Initial evaluation included history and physical examination, (See Table 1) plain radiographs, blood laboratory analysis (See Table 2), debridement of infected tissue, deep tissue biopsy of soft tissue or bone for culture and sensitivity. Eight of the patients had diminished palpable pulses or delayed capillary return time and outside vascular laboratory analysis including bidirectional doppler with toe pressures were obtained. (No patients had vascular by-pass surgery during this course of care). There were no patient admissions or IV administration of antibiotics during the course of care. Outside home health agency nurses were trained in this protocol to assist with patient home bound care on a daily basis. Nurses also monitored patient compliance for diabetes checks, antibiotics being administered, etc. Figure 1: Demonstrating the technique of instrumentation to probe to bone with blunt instrumentation. The physician should probe gently until resistance is met and then feel the tissue with the instrument. This minimizes trauma to surrounding tissue. If the lesion had not been probed prior to debridement, the sites were surgically traced at the time of initial surgical debridement, to determine if infection was in bone. Plain radiograph, bone, and soft tissue changes were used to aid diagnosis. Deep soft tissue specimen or bone specimen (Figure 2) was obtained for culture and sensitivity analysis. Upon completion of surgical debridement, wounds were packed with type I bovine collagen mixed with gentamycin (Figure 3) followed by secondary sterile dressing. Figure 2: Obtaining tissue specimen from infected tissue. Figure 3: Packing the infected tissue should be done with light packing, as collagen expands when fluid is applied to it. 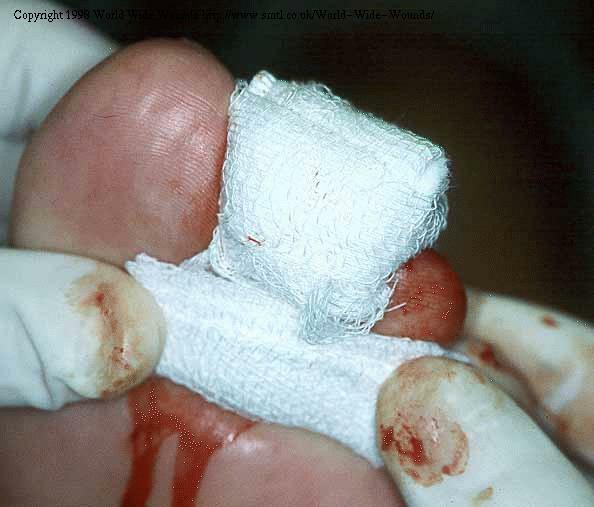 Initially, if the lesion involved distal toes, then 5cm x 5cm gauze was rolled and placed into sulcus of toe at the initial dressing (Figure 4) to assist with depressurizing the digit. All 12 patients were placed into surgical shoe, which was modified to for depressurization of the affected area and to allow immediate limited ambulation (meal table and bathroom). Figure 4:Application of 2 x 2 gauze pad incorporated into dressing to function as buttress pad for depressurizing the distal osteomyelitic digit. All patients attended clinic at least twice the first week and then weekly for serial evaluations until the infection was resolved and wounds were closed. All laboratory reports were re-evaluated at the second visit. When bacterial organisms were determined to be resistant to gentamycin or the oral agent, then a change in antibiotics was made (Table 3). Three of the patients received Clindamycin impregnated into type I bovine collagen and three of the patients received Vancomycin impregnated into type I bovine collagen. If resistance was reported to initial oral agents, selected patients oral agent was changed based upon sensitivity results from culture report. Patients remained on oral agent until infection was localized. All patients had repeat of CBC with differential, ESR, CRP, every two weeks until results returned to normal. Serial plain radiographs were utilized to follow osteomyelitis cases until clinical and radiographic resolution of osteomyelitis was determined. In the event of premature closure, then infection site was re-opened (Figure 5and 6). 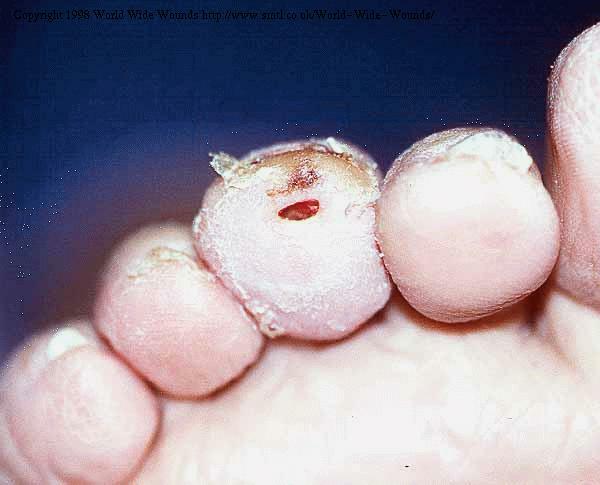 Figure 5: Premature closure of infected toe. Note the erythema and bulby aspect of the toe with crust-like closure of infected toe. Figure 6: Same patient, after superficial covering has been debrided. Note appearance to depth of tissue with potential for deadspace to act as reservoir for continued bacterial growth. All patients were followed until 30 days after clinical complete resolution of infection process. After initial infection was brought under control, surgical shoes were modified to include pads to allow for depressurization of plantar or digital lesions. Long term care included prophylactic surgery to improve biomechanical forces or biomechanically correct orthotics. Wash area with PCMX 3.0% (Technicare) saturated gauze pad. Rinse with sterile saline until all soap residue is washed off. Apply collagen antibiotic mixture to infected location until about 2/3 full. Apply pad (specialty absorptive or foam) over wound area and secure with transparent adhesive covering. Cover the affected area with with gauze and secure with netting. The gauze cover was applied because many patients found that the film dressing would roll or stick to clothing; the gauze reduced the incidence of interference. Dressings were applied daily, because patients were unwilling to accept alternate-day dressings. All 12 patients had initially received the same or very similar materials (Table 4). As the cases progressed clinically, modifications in materials utilized were made based upon a combination of patients clinical course laboratory reports and surgeons judgement. The type I bovine collagen and antibiotic mixture were provided to each patient from the clinic and patients were required to bring their mixture for each clinic visit. Specialty Absorptive Pads Ex-U-Dry Ex-U-Dry, Inc. The combination of antibiotic impregnated into the collagen is generically described below and specifically listed in Table 5 for individual antibiotics. A total of 15cc of type I bovine particles were poured into a sterile container. The antibiotic was then measured in a sterile syringe and squirted slowly directly on the particles in the container. With a sterile tongue depressor blade, the mixture was stirred until non-lumpy paste was achieved. The container utilized is a light, air tight container. (Note: the author is unaware of any shelf life data of this mixture.) The patients were instructed to storethe mixture in a dark, non-humid cabinet/closet, such as linen closet at home. Yields 10mg of gentamycin/cc of collagen particles. Yields 60mg of clindamycin/cc of collagen particles. Dissolve 1 g of vancomycin powder with 10cc of a local anesthetic (lidocaine). Yields 66mg of vancomycin/cc of collagen particles. At the initial visit, patients were fitted for their surgical shoes which were later modified with additional pads or toe crests to depressurize the infected location. After the initial debridement, infected wounds were intentially left open to drain. Foams and specialty absorptive pads were applied to keep external contamination to a minimum. Oral agents utilized were changed based upon the sensitivity results of tissue cultures. Additional antibiotics selected included Ofloxacin, sulfamethoxazole trimethoprim, doxycycline. Oral agents were continued until infectious disease was localized. In this report, all 12 patients were initially treated with gentamycin impregnated into type I bovine collagen. In addition, with generalized cellulitis being present all patients were told to remain in bed or on a couch at home. They were all treated with warm moist compresses from the knee to the ankle/mid foot. The intention was to keep the warm compress off the infected area and dressing. In addition, five patients were given cephelexin 500mg (2g per day, split dosing QID) and clindamycin 300mg, (900mg per day, split dosing TID). No patients were hospitalized or received injection administration of antibiotics. Tissue biopsy culture results and sensitivity. Clinical localization of infection, with general resolution of cellulitis; clinically the drainage no longer appeared purulent. Due to potential of adverse drug reaction reported for clindamycin in long term use, change was made when culture allowed, to limit the risk of pseudomembranous colitis. The oral agents utilized in all cases were discontinued after three weeks. The standard of care in osteomyelitis is a minimum of six weeks; the remainder of the infectious disease resolution was thus the topical treatment of the antibiotic impregnated into the type I bovine collagen. Patient resolution to complete healing ranged from 35 to 162 days. Patient VA was referred as an alternative to amputation by his primary care physician. His ABI was reported as 0.41 with toe pressures of 60mm of Hg. His initial care consisted of avulsion of his second toenail, debridement of necrotic tissue, curretage of osteomyelitic bone with bone specimen for tissue culture report. He had a polymicrobial infection. He was changed to collagen/clindamycin on the 4th day and the wound had completely resolved in approximately 90 days (Figures 7-27). 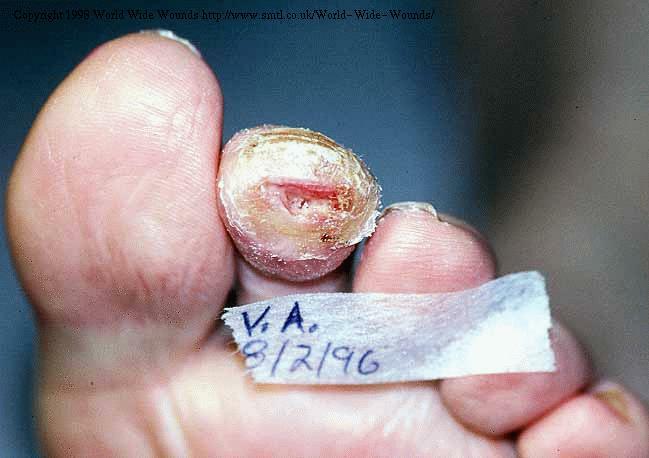 Figure 7: Initial presentation of a 74 year old male with an infected ulcer of the second toe, right foot. The patient had been treated at a local diabetes treatment center without success. Recommendation from orthopedic specialist in foot and ankle was to admit to hospital for IV antibiotics and schedule for amputation. ABI had been reported to be 0.41 with toe pressure reported as approximately 60mm Hg. It can be seen in Figure 7 that the toenail looks non-viable. There is mild generalized edema, without gross severe systemic cellulitis. Figure 8: Toenail avulsed. Superficial skin has been debrided, plantar view. Figure 9: Curettage of the bone was performed for culture and sensitivity purposes. Toe is shown post curettage. Figure 10: The toe after packing with gentamycin impregnated into collagen. Figure 11: Presentation of second toe 48 hours post biopsy. Figure 12: Presentation of toe at Day 6 post biopsy. Home health nurses had been asked to change from gentamycin to clindamycin in collagen, 48 hours prior to this visit. Necrotic tissue was debrided at this visit; clindamycin in collagen and other orders to be continued. Figure 13: Follow-up at Day 13. On day 13 (see (see Figure 13), minimal necrotic tissue is noted. Perimeter of wound shows good granular bed that is present. Collagen lattice is present in mid-central portion of wound bed. Figure 14: Follow-up visit at Day 18. On day 18 (see Figure 14), the digit showed minimal edema and erythema. There was still a dusky appearance to the toe, but the wound continued to show improvement in size, shape, and appearance. The toe is shown post debridement. The granular tissue continues to develop. Margin depth was getting narrower. Appearance of keratin development to perimeter as wound gets smaller and contracts inward. Figure 15: Follow-up visit Day 25 (one week later). Day 25 (Figure 15), the wound has developed a hyperkeratotic. There is minimal maceration with collagen lattice in the central portion of wound bed. Figure 16: Same visit, post debridement. After debridement (Figure 16), it can be seen that the bed is now virtually 100% granulated across. The wound continues to get smaller and shallower. Figure 17: Follow-up visit Day 32. Figure 17 shows the wound on day 32, pre-debridement. The antibiotic collagen mixture has liquified but has not been absorbed by the external secondary dressing. Hyperkeratosis build-up, as seen in previous pictures, is significantly lessened this time. Figure 18: Day 32, post debridement. After debridement (Figure 18), erythema is minimized. Digit shows minimal bulby aspects to it. No local edema is visible. Change in position of shoe buttress pad was made this visit. 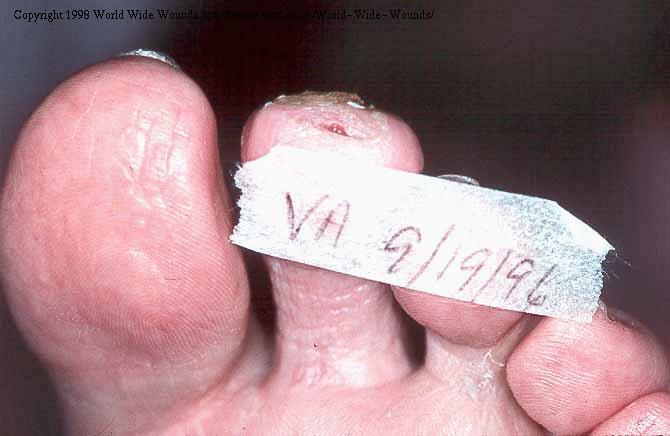 Figure 19 on day 39 shows the wound pre-debridement. The hyperkeratotic rim is significant in spite of attempts to depressurize digit. A change in position of the shoe buttress pad was made at this visit. Figure 20: Follow-up visit, Day 53. It can be seen in Figure 20, from day 53, that the toe shows no erythema, edema, undermining or tunneling. The wound is continuing to shrink. Figure 21: Follow-up visit, Day 74. On day 74, (Figure 21), the wound is epithelialized. The digit shows complete resolution of infectious process. Figure 22: Follow-up visit 10 weeks later. At a follow-up visit 10 weeks later (Figure 22), the wound site is 100% epithelialized. The toe shows minimal scarification and the skin is soft, supple, pliable. Patient VA is now one year post ulcer with osteomyelitis. The digit remains pink, clean, clear and closed without any signs or symptoms or other sequella of potential breakdown being present. Patient GW is on renal dialysis. Her MRSA was determined to be sensitive only to vancomycin. Thus no oral agents were continued. Her ABI was determined to be greater than 1.0. It was determined that she does suffer from Mockinberg's sclerosis and thus was maximally vasodilated. About the 30th day, her skin was superficially closed, yet clinically she remained bulby erythematous and it was felt that she was still infected. (See Figure 5 and Figure 6) Thus her toe was reopened and continued treatment with Vancomycin in collagen until resolution of the osteomyelitis. Her toe was closed about the 60th day from initial presentation. Patient TD had an initial history of a neurotrophic diabetic ulcer which was non-healing. Her status post CVA had precluded any clearance for vascular reconstruction. She had been infected approximately two months prior to her initial presentation. Her ulcer was 11 months old. Prior antibiotic usage had included Ciprofloxacin. Her culture report for the gram negative organisms was extended out to specifically test for the Clindamycin she was started on. Although the polymicrobial infection was sensitive to it, she developed diarrhea after five days or oral Clindamycin. Thus she was changed to oral doxycycline BID for three weeks. Her infection was found to travel through the flexor hallucis longus tendon sheath. Her course of care was uneventful and this lesion was completely healed in 49 days. Patient GN had applied topical corn medicine to her toes and also was recalcitrant to staying out of the garden. Both organisms grown from bone culture were reported as sensitive to all antibiotics except penicillin. Her infection location was completely healed in 56 days. 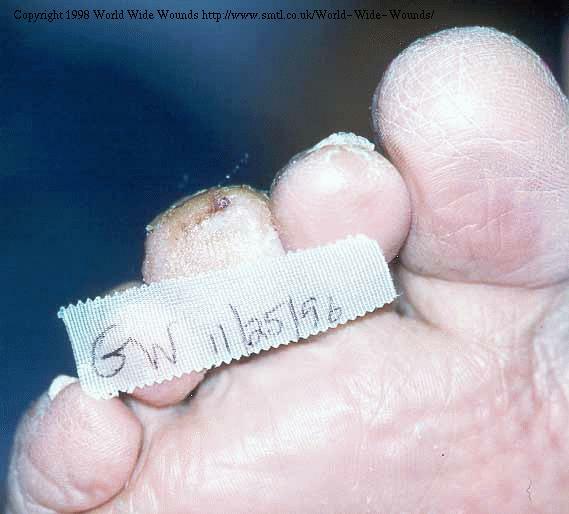 Patient GW is a 98 year old, long term care facility resident, who had a distal lesion of her third toe. Although communicative, she was mildly hostile to the shoe gear changes that were ordered for her. Her staphylococcal organism was reported as resistant to cephalosporins. Her clinical course was initially very stormy due to her lack of cooperation involving the shoe gear during the first two weeks. After she realized the need to keep dressings intact and appropriate shoe gear in place, her toe healed uneventfully. Total duration from the inception of her case was approximately 90 days. Her vascular status was surprisingly quite good with an ABI of 0.96 and toe pressures of 110mm Hg. Patient PM was injured by a horse. She developed an active charcot foot with bounding pulses. Initially her hemoglobin A1C was reported as 11.3 with a random blood sugar of 334mg per 100ml. She was brought under control by tight, four times daily finger sticks and close cooperation with her primary care physician. Her tissue biopsy was reported as sensitive to all antibiotics except penicillin and tetracyclines. The initial injury location of her fifth metatarsal was initially necrotic to bone. Her wound healed in approximately 70 days. Patient PB utilized the theory of 'a little is good, a lot is better' and continuously applied corn medicine to her baby toe. The resulting lesion was a soft tissue infection to her 5th toe. Her status of being post CVA on Coumadin did not affect her healing. Her ABI was reported at 0.63 and toe pressures were reported to be 90mm Hg. Her cellulitis was evident with palpable inguinal and popliteal nodes. Based upon her soft tissue biopsy culture of the necrotic tissue deep to the burn she self inflicted, she was well maintained with sulfa methoxazole/trimethoprim orally for her cellulitis. Her toe healed uneventfully in about 35 days. She did have prophylactic hammertoe surgery for her toe after the infection was resolved and the toe completely healed. Patient JP sustained digital injury to three different toes when he slipped and fell and abraded his third, fourth and fifth toes. His endocrinologist initially treated these lesions with Bactroban and oral Cephalexin. When he was referred, the orthopedist had recommended an AK amputation due to his severe peripheral vascular disease. His endocrinologist was aware of the author's current treatment protocol and made the referral instead of the amputation. This patient had ABI of 0.31 with a toe pressure of 40mm Hg and no known run off on his angiogram. His tissue biopsy culture report revealed MRSA and S. Epidermidis, both resistant to Clindamycin and Gentamycin. The organisms were isolated as sensitive only to Vancomycin and sulfamethoxazole and trimethoprim. Although slow to heal, his infected soft tissue lesions did resolve; the first one in 97 days, the second one in 111 days and the third one in 140 days. No amputation was performed. Patient RS was initially dancing with her husband and someone stepped on her ingrown toenail. When she presented a week later, her entire left hallux was erythematous, bulby and edematous. Upon avulsion of her toenail, a surprising sinus tract was traced directly to her distal phalanx of her hallux. Her bone biopsy tissue culture was positive for Staph. Aureus, which was sensitive to both cephalexin and gentamycin. In two weeks, her digital cellulitis was resolved and the cephalexin was discontinued. She was healed in 42 days uneventfully. Patient B had a distal segment by-pass to her left dorsalis pedis artery six months prior to her injury of her fifth metatarsal. She suffered from a displaced fracture of her fifth metatarsal shaft. Open reduction with internal fixation was performed and she was put in a Cad-Cam walker for healing the fracture site and to minimize potential for atrophy to muscle in her leg. She decided to put a high heel shoe in her foot and go to church on Easter Sunday. She removed all dressings to the surgical location due to her tight shoe. The location became infected and she failed to keep follow-up appointments for 10 days. Her daughter found her at home with a raging cellulitis and her HMO refused her admission to hospital. Her distal segmental by-pass did clot off during her cellulitic episode. The hardware and fractured bone was removed surgically on an outpatient basis. She achieved complete closure without amputation in 162 days. Of significance, her culture report showed no oral agent which would treat her MRSA or enterococcus. Patient FM was referred by his primary care physician for a neutrophic diabetic ulcer which he sustained while driving his automobile for 15 hours with minimal stopping. His personal hygiene was quite poor. He wore no socks and cheap, old, torn gym shoes. He had an ABI of 0.66 with toe pressures of 100mm Hg. His healing was uneventful in about 60 days. In today's healthcare world, we are all being forced to look for alternative venues with changes in delivery of healthcare. Cost effective healthcare has been forced on all physicians. This limited anecdotal case report may be a method through which all physicians can deliver cost effective care without need for lengthy hospital stay. The literature shows good evidence of why triple helix arranged type I collagen can act as a sustained release vehicle and that many drugs can apparently be delivered on a linear zero order release kinetic basis. It was not possible, in this study, to measure tissue antibiotic levels. However, previous research  has shown how there is minimal, if any, of the toxic drug absorbed into the blood stream. This is despite evidence of achieving tissue levels that cannot be achieved through systemic administration of potent drugs like gentamycin (due to the ototoxicity and nephrotoxicity associated with this drug). This article illustrates the treatment and care of significant infections involving eight different organisms and three different drugs. The numbers presented here are too small for any scientific conclusions to be drawn from this. The author is well aware that further laboratory and clinical work is needed to provide the scientific evidence required to create specific outcome results associated with different infections like those presented here. As a rural practitioner, this limits the author from obtaining the large population base needed to really expand this out further. This limited anecdotal report does show that there is potential for cost effective outpatient care even when serious limb threatening infections are treated. The author admits that a significant amount of work remains to be performed before any real conclusions about safety, efficacy, and care statements could be made. The author gratefully acknowledges the home health division of the Garland County Health Department and its nurses, for their due diligence in patient care without which this case report probably would not have been able to be made. Thanks to Bill Danzeisen DPM, for scanning the photographs. Prockop, D.J., Kivirikko, K. I.: Collagens, Molecular biology, diseases and potentials for therapy. Annual Review of Biochemistry, 1995;64: 403-434. Miller, E.J., Gay, S.: Collagen structure and function. Wound Healing: Biochemical and Clinical Aspects, Ch. 8, Cohen, I., Diegelmann, R.I., Lindblad, W.J., editors, W.B. Saunders 1992: 132. Prockop, D.J., Berg, R.A., Kivirikko, K.I. : Intracellular steps in the biosynthesis of collagen. Ramachadren, G.N., Redd, A.H., editors, Biochemistry of Collagen, Plenum Press, N.Y., 1976: pp. 163-273. Thacharidi, D., Panduranga, Ra, O.K. : Collagen - chitosan composite membranes controlled transdermal delivery of nifedipine and propranalol hydrochloride, International Journal of Pharmaceutics 1996: 34, pp: 239-241. Kollenberg, L.: Type I Bovine Collagen and Wound Care; A Study on 1000 Patients, Poster Presentation, International Burn and Wound Federation, February 1997, Maui, Hawaii. Statz, C., Johnson, E., Ukins, M., Dunn, D.: A Retrospective Review of 30 Consecutive Patients with Open Wounds Treated With Techni-Care, University of Minnesota, Department of Surgery, Minneapolis, Minnestota.